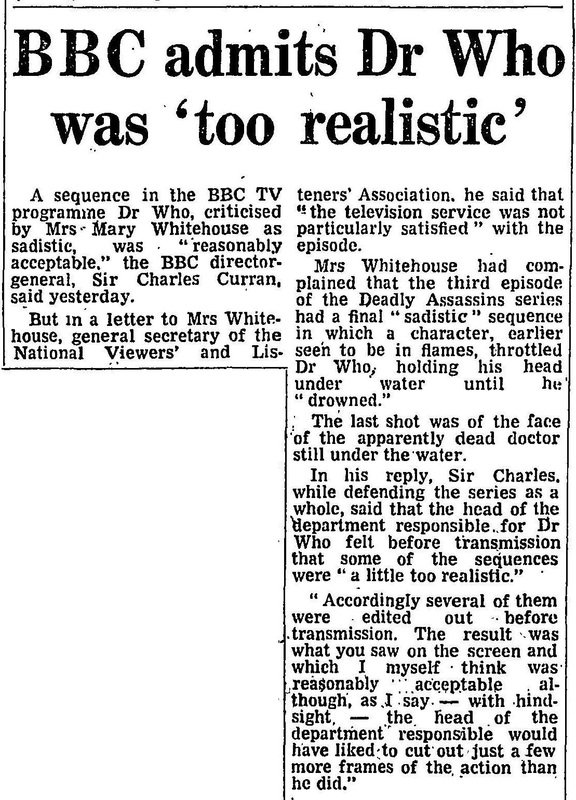 A sequence in the BBC TV programme Dr Who, criticised by Mrs Mary Whitehouse as sadistic, was "reasonably acceptable." the BBC director-general, Sir Charles Curran, said yesterday. But in a letter to Mrs Whitehouse, general secretary of the National Viewers' and Listeners' Association, he said that "the television service was not particularly satisfied" with the episode. Mrs Whitehouse had complained that the third episode of the Deadly Assassins series had a final "sadistic" sequence in which a character, earlier seen to be in flames, throttled Dr Who, holding his head under water until he "drowned." The last shot was of the face of the apparently dead doctor still under the water. In his reply, Sir Charles, while defending the series as a whole, said that the head of the department responsible for Who felt before transmission that some of the sequences were "a little too realistic." "Accordingly several of them were edited out before transmission. The result was what you saw on the screen and which I myself think was reasonably acceptable although, as I say — with hindsight — the head of the department responsible would have liked to cutout just a few more frames of the, action than he did." APA 6th ed. : (1976-12-29). BBC admits Dr Who was 'too realistic'. The Guardian p. 16. MLA 7th ed. : "BBC admits Dr Who was 'too realistic'." The Guardian [add city] 1976-12-29, 16. Print. Turabian: "BBC admits Dr Who was 'too realistic'." The Guardian, 1976-12-29, section, 16 edition. This page was last modified on 28 July 2018, at 03:55.